We’ve worked with many creative writers over the years to perfect their query letters—whether we’re helping to improve on an existing query or putting our heads together and starting from scratch. We’ve helped many writers learn to pitch literary agents via queries! Our query letter tool kit is your secret weapon! What Is A Cover Letter Or A Query Letter? Don’t know where to start? Yes, you do. Right here! The Query Letter: What To Include In A Letter To Literary Agents. This is an anatomy lesson in query letters. Break out the rubber gloves and learn the parts of a query letter. Before You Start Writing Your Query Letter—Do This First. Set yourself up for success by establishing a strong foundation with these important pre-query steps! Top Query Letter Mistakes: Avoid These Amateur Errors. Our Review Board reads many submissions. And we see the same mistakes again and again. This article is highly recommended. Query Fail: How NOT To Write A Query Letter. If you want your pitch to stick out in a good way, read this example of a query letter gone terribly wrong. Your Query Letter: Write A Fantastic First Line. If your book lends itself to a quick summary, you might consider using a log line to open your query letter. Striking The Right Tone. Worried about how to sell yourself? Will you go for bells and whistles? Or quiet and understated? Learn how to sound confident but not bombastic. Query Letter Etiquette: How To Strike A Friendly But Professional Tone. If you’re writing a query letter to pitch your book to a literary agent, you may want to consider using a natural, friendly voice rather than a more formal, standoffish, traditional tone. How To Polish Your Query Letter For A Professional Shine. It’s vital that your query letter holds up against other letters that have been critiqued, honed, and prepared by query-writing professionals. To give yourself a professional advantage, try these steps! Pseudonyms: Using A Pen Name In Query Letters. It’s one thing to use a pen name when you’re interacting with your adoring fanbase. But if you sign with your pen name…well…that’s a different story. The Query Letter—From a Marketing Standpoint. Much as we want a query letter to be about presenting the facts of a novel or book, it’s really a kind of advertisement. A Checklist For Writers. A simple checklist that will help you see if you’re on the right track with your query. 9 Query Letter Phrases That Get Results. Our expert query letter writers share the strategies that can get better results when used in our clients’ letters. 8 Ways To Shorten Your Query Letter Without Losing Effectiveness. After writing a 100,000-word book, writing a one-page query letter should be easy, right? Wrong. Here are some edits you can make to trim your query while still grabbing the attention of a literary agent. Should You Make Book Comparisons In Your Query Letter? While it may be helpful for a literary agent to see the titles you feel are similar to your novel or memoir, there are also potential drawbacks. How To Write A Query Letter For A Short Story Collection. This article isn’t just a query letter primer; it’s a discussion of the larger issues that surround short story collections. 5 Secrets For Getting A Literary Agent To Read Your Query. Make the best impression on literary agents by dazzling them from the get-go while avoiding certain red flags that they look for to differentiate work they might represent from straight rejections. Is Your Query Letter Too Emotional To Get Results? A query letter should get a literary agent excited enough to request more information about your book. But some writers can be a little too intense—and too much excitement in your query can have the opposite effect on a literary agent’s interest. 3 Lessons For Query Letter Writing From The Election. This presidential campaign has been one for the books. Believe it or not, we’ve found some positive lessons from the 2016 election that you can apply to your query letter writing. Query Letters: How To Stand Out In The Slush Pile. Ashley Christman, Executive Editor and Publisher at Entranced Publishing, was kind enough to offer our readers some straight-from-the-source insider information on how your query is evaluated once it reaches her desk. 5 Book-Pitch Selling Points: The Complete Package. If you want to hit the high points and impress agents with your book pitch, you’ll want to demonstrate that you’re the complete package—the right author with the right book at the right time. True Story: How To Write A Query Letter For A Memoir. Our simple, effective tips will help you write a query letter for a memoir that will have literary agents wanting to know more about you and your unique life story. Query Letters: How To Think Like A Literary Agent. If your query letter isn’t getting the results you want, maybe it’s time to start thinking like a literary agent. The Single Most Important Thing Your Query Letter Must Do If You Want To Get A Literary Agent. Creating an emotional experience for the reader is the single most important thing that your query letter can do if you want to get a literary agent’s attention. 7 Tips For Writing Your First Query Letter For Your Book. Sitting down to write your very first query letter for your book can be nerve-racking. Here are 7 tips to make the process easier! Tactful Ways To Say Awkward Things In Your Query Letter. Sometimes the things a writer has to say in a query letter for literary agents are, uh, aaawk-ward! Here are a few ways to rephrase uncomfortable facts into tactful prose. Query Letter Genre Essentials: Pitching Sci-Fi And Fantasy Novels. Have a sci-fi/fantasy novel you want to pitch? Find out how to query it to agents here! How To Write A Query Letter For A Biography, History, Or Popular Science Book. Not sure how to pitch your biography, history, or popular science books to agents? Check out these tips here! How To Write A Killer Book Blurb For Your Query Letter: What Literary Agents Want To See. A simple list that will teach you how to write the mini-synopsis for your query. Query Letter Synopsis: Maximize Your Main Conflict. Advanced blurb writing. Are you focusing on your main conflict? Which plot points belong in a blurb? Which don’t? Query Letter POV: Choosing The Right Point Of View In Your Query Letter. The POV in your book blurb is a very subtle but important element, and the best query letter book summary will always take point of view into consideration. Five Strategies For A More Evocative Query Letter Blurb. Strategies to help capture agents’ attention through your query letter blurb. 5 Common Synopsis Mistakes That Fiction Writers Make. Don’t make these five common errors when writing the synopsis for your novel! Give Your How-To Or Self-Help Book Blurb A Personal Touch. Aside from offering the “facts” of what your book is about, consider this strategy: Make it personal. Query Letter Point Of View: Point Of View Shifts In Novel Blurbs. If a POV shift is not orchestrated carefully, it can disrupt the flow of the query blurb. How To Write A Killer Query Letter For Self-Help And How-To Books. Writing a query letter for your self-help or how-to book? Follow this template to craft a great the ultimate persuasive pitch! How To Get A Famous Author To Endorse Your Book. Whether you’re a new writer or a veteran, asking someone for an endorsement may seem intimidating. Don’t worry! A Sample Letter For Writers Requesting A Book Endorsement. Before you write a letter to an author requesting a quote, endorsement, or blurb for your book, take a look at our sample letter. Your Query Letter Bio: Listing (Or Skipping) Your Publication Credits. Thinking you’ll mention in a query that you’ve already written the first fifteen books in your series? Read this first. How To Build Up Your Writing Bio Super Fast. We’ve all been there. At some point, everybody has NO publishing credits. Here are some things you can do to help your cause while you wait for publishing credits to roll in. Tips For Your Professional Writing Bio. Author biography basics. Doing The Publishing Credits Shuffle. Wondering how you should order your publishing credits? What a great problem you have! Read this. When (Not) To Include Your Self-Published Book In Your Query Letter Bio. We love self-published books and authors. Here are some things to consider when deciding whether your self-published book is worth mentioning in your author bio. Getting Personal In Your Author Bio: How To Know When It’s TMI. It can be difficult to tell how much information is too much when you’re writing your author bio for your cover or query letter. Here are some tips to help you out! You Wrote A Query Letter: What Next? How To Research The Best Literary Agents For Your Book. You’ve got the letter, now find the agent. How To Interpret Submission Guidelines. Simultaneous submissions? Multiple submissions? Exclusives? This may clear up some confusion. How To Address A Literary Agent Or Editor In A Letter When You Don’t Know The Gender. Don’t assume “Alex” is a boy. And avoid “Dear Sirs” (there are women who work in the publishing industry. Plus, it’s no longer 1985). Before you write your salutation, know the new etiquette. How To Resubmit Novels or Nonfiction Books To Literary Agents. Ready to resubmit the book that you’ve been revising after so many “near misses”? Here’s how. When And How To Follow Up With (Or Nudge) A Literary Agent About Your Book Query. Let’s face it: Publishing can be a waiting game. But there are instances when you’ll want to take an active approach. Use our tips to avoid stepping on toes. What Are Simultaneous Submissions?. What are “simultaneous submissions,” and how can they benefit you? Find the answers here. Online Writing Submissions: Mistakes Writers Make Submitting To Literary Agents And Editors. If you’re submitting your work online, avoid these common errors. E-Queries: How To Submit Online To Agents And Editors. Sending an e-query is no excuse to be sloppy. So know the rules. How To Interpret Rejection Letters From Literary Agents And Editors. If you’re sending out queries, you’re probably getting rejections. Here’s how to interpret the language of generic and personal rejection letters. Please bear in mind that knowing how to write a good query letter is only one tiny piece of making a successful connection with a literary agent. You’ll also need do a lot of research to find the agents who are appropriate for your query (and eliminate those who aren’t appropriate). And, of course, the strength, originality, and marketability of your book will be a major contributing factor to your success. If you would like to submit your book for consideration at Writer’s Relief, view our submission guidelines. 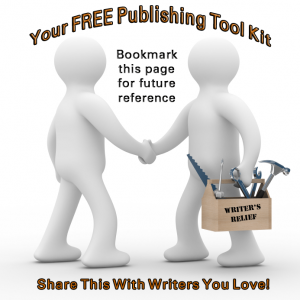 LIKE and TWEET to share this resource with the writers you know!